Pockels cell are used to change the polarization state of light passing through it when a voltage is applied to the electrodes of electro-optic crystals such as BBO. * Quarter wave voltage is calculated for DC Voltage at indicated central wavelength. Pulsed operation voltage is typicall up to 10% higher. Above standard BBO Pockels cells have protective ceramic apertures with diameter equal to clear aperture of crystals. 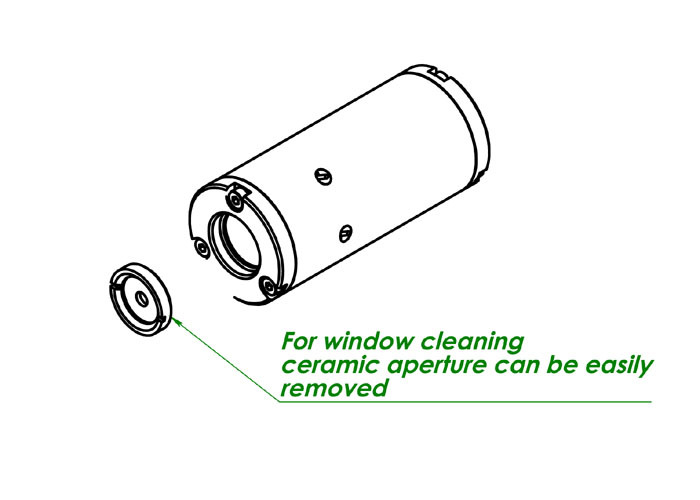 Ceramic apertures can be removed to have access to the full aperture of the electro-optical crystals. All crystals for the Pockels cells provided above are coated AR/AR@1064 nm. Other antireflection coatings are available under request. Damage threshold >5 J/cm2 for 10 ns pulses at 1064 nm. Specifications are subject to changes without advance notice. Pockels cell are used to change the polarization state of light passing through it when a voltage is applied to the electrodes of electro-optic crystals such as BBO. When used in conjunction with polarizer, Pockels cells can be used as fast optical switches. Typical applications include Q-switching of the laser cavity, laser cavity dumping and coupling light into and from regenerative amplifiers. BBO based Pockels cells can be useful at wavelengths from the UV to more than 2 μm. Low piezoelectric ringing makes these Pockels cells attractive for the control of high-power and high pulse repetition rate lasers. Fast switching electronic drivers properly matched to the cell are available for Q-switching, cavity dumping and other applications. Pockels cells of PCB series are transverse field devices. Low electro-optical coefficient of BBO results in high operating voltages. The quarter-wave voltage is proportional to the ratio of electrode spacing and crystal length. As a result, smaller aperture devices have lower quarter-wave, however even for 2.5 mm aperture devices the quarter-wave voltage is as high as 4 kV @ 1064 nm. Double crystal design is employed to reduce required voltages and to allow operation in half-wave mode with fast switching times.